From Santa Cruz to Myrtle Beach, hundreds of cities and communities have decided they need a new vision for the future. In all the communities, both the process and the product are remarkably similar; both the process and the product are prescribed in Agenda 21. Birmingham, Alabama began its “visioning” process in 1996, when Dr. Neal Berte, president of Birmingham-Southern College, invited 56 individuals to meet to develop a visioning process that grew into “Region 2020.” The process included 17 different meetings, involving more than 1800 people, who produced 4727 ideas, which were refined into 34 goals, and 217 strategies, which are to be implemented throughout 12 counties. Virtually all the goals are recommendations set forth in Agenda 21. Virtually all the goals are also recommendations set forth by the President’s Council on Sustainable Development (PCSD). 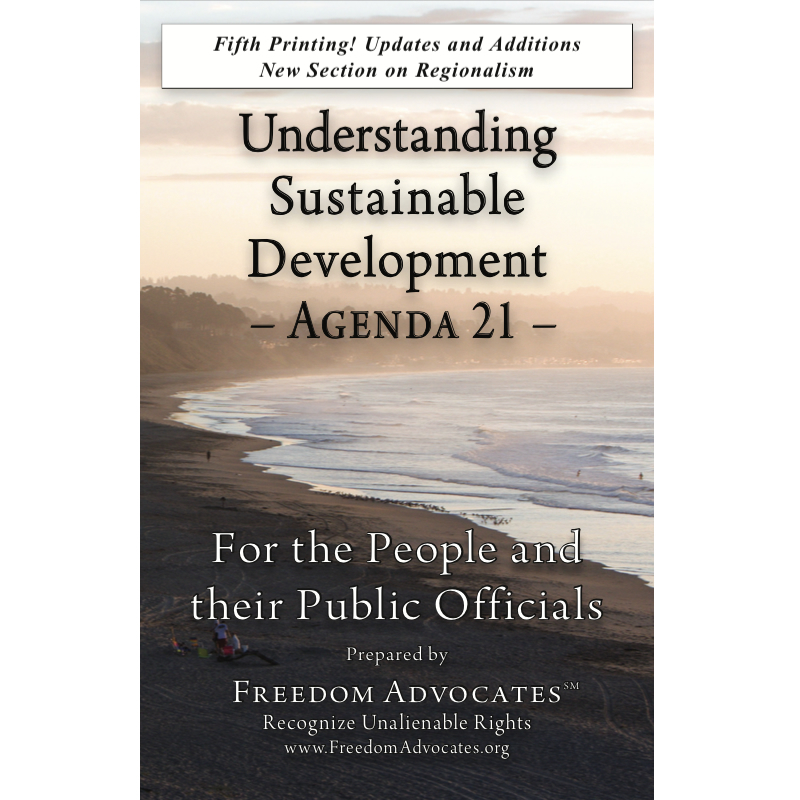 In other words, after all the hoopla of the visioning process, the goals identified by the group are essentially the same goals that both Agenda 21 and the PCSD say should be adopted to promote sustainable development. Tucson’s visioning process produced 17 goals. Surprise, surprise – they are essentially the same goals adopted in Birmingham. Every community’s vision is expressed in localized language, but all contain the essential principles of sustainable development as set forth in Agenda 21. How can hundreds of communities all come to the same conclusions about what is best for the future of their towns? It’s called social engineering. It is the result of skillful manipulation of people in a process called “collaborative consensus building.” It is a process where the outcome is known in advance, and the participants are led to believe that the end product is actually their own. Agenda 21 was adopted in 1992 by 179 nations that attended the United Nations Conference on Environment and Development, including the United States. President Bill Clinton created the President’s Council on Sustainable Development by executive order, in 1993. By 1997, the PCSD had developed a full-blown program for implementing Agenda 21 across America, using the agencies of government, and tax dollars. The official report of the United States to the U.N. in 1997, reveals the extent to which the Clinton administration was devoted to the global agenda. The Smart Growth Network (SGN), for example, is a nationwide effort coordinated by the U.S. Environmental Protection Agency’s (EPA) Urban and Economic Development Division. EPA is supporting the SGN through cooperative partnerships with organizations such as the International City/County Management Association (ICMA). ICMA serves as the organizational “home” of the SGN and runs its membership program. Membership in SGN is separate from membership in ICMA. Among the partners with the EPA in promoting “Smart Growth,” is the Congress for the New Urbanism (CNU). The chairman of the “Best Practices” Task Force, for the CNU, is Gianni Longo, who is also a principal of American Communities Partnership, a New York Consulting Firm hired to facilitate the visioning process in Birmingham, New Haven Connecticut, Washington D.C., and most of the other cities in the table above. No wonder the “visions” all wind up looking the same. So what. What’s wrong with “smart growth” plans? What’s wrong, is both the process and the product. In the first instance, government should not be in the business of telling citizens where and how they should live. This fundamental principle is a major distinction between America, and almost every other nation. In Socialist countries, the function of government is to tell people where and how they should live. Nothing in the U.S. Constitution gives the government such authority. Yet, the President’s Council on Sustainable Development, and the agencies of government, have decided that people in America should live their lives as prescribed by Agenda 21, and are actively pursuing public policies to force people to comply with Agenda 21 recommendations. The process is particularly onerous. It’s called “collaborative consensus building,” but in reality, it is the implementation of pre-conceived ideas, in ways that by-pass or avoid accountability through elected officials. Our system of government provides ample opportunity for any citizen to present any idea or proposal to any governing body – city council, county commission, state legislature, or the Congress of the United States. When policy proposals are presented to, debated, and adopted or rejected by elected officials, the people can hold those elected officials accountable. “We need a new collaborative decision process that leads to better decisions; more rapid change; and more sensible use of human, natural, and financial resources in achieving our goals.” (PCSD We Believe Statement #8). The objective is to avoid or by-pass elected officials who can reject or modify any policy proposal, and put the policy-making authority in the hands of professional bureaucrats. In Birmingham, and in every other community where the visioning process has produced a localized version of Agenda 21, every elected body of government affected by the vision, should retain absolute veto power over any or all provisions of the vision. No policy should be implemented in any community without, first, the authorization of that policy by elected officials who can be held accountable. Anything less is a major erosion of the first principle of freedom: legitimate government is empowered by the consent of the governed – not by the recommendations of Agenda 21, the President’s Council on Sustainable Development, or by the “visions” on non-elected professionals, no matter how well-meaning they may be. Smart Growth is Agenda 21 by Henry Lamb Henry Lamb is the Executive Vice President of the Environmental Conservation Organization (ECO). See www.freedom.org. Henry Lamb has a comprehensive archive totaling more than 2,000 pages and accumulated since 1994, located at Sovereignty International’s Library. *More information – What is Unsustainable?